Workers were to perform high-risk tasks in confined spaces under breathing air where their breathing activities were to be monitored at all times. It was crucial to provide the ability to immediately identify abnormal breathing patterns before the situation could turn life threatening. An additional challenge was that there was no line of sight and traditional methods were cumbersome. The article then goes on to explain how United Safety took on this challenge and solved it with Innovation. 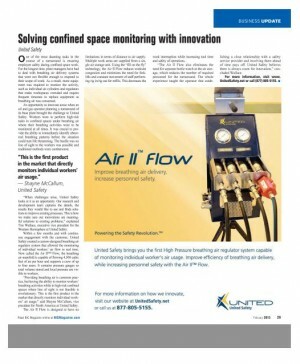 Within a few months and with continuous engagement with the customer, United Safety created a custom-designed breathing air regulator system that allowed the monitoring of individual workers’ air flow in real time: the Air II™ Flow. Subscribe for our Premium Content to read the article in full.